Liverpool returned to the top of the Premier League with a comfortable 3-0 win over Bournemouth at Anfield. 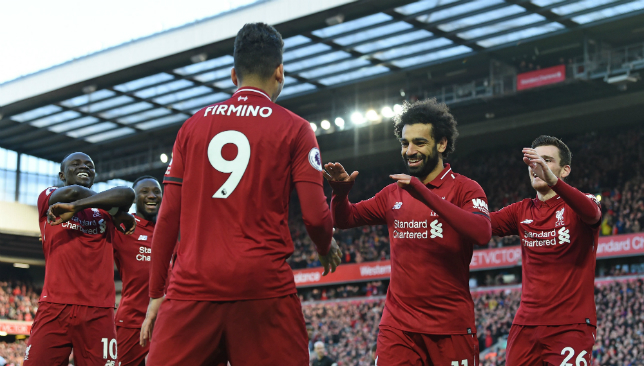 The Reds put aside their recent anxieties as they lifted themselves three points above champions Manchester City with goals from Sadio Mane, Georginio Wijnaldum and Mohamed Salah. Mane rewarded Jurgen Klopp’s men for their early dominance by heading home his fourth goal in four matches after 24 minutes and Wijnaldum added a second with a neat lob 10 minutes later. 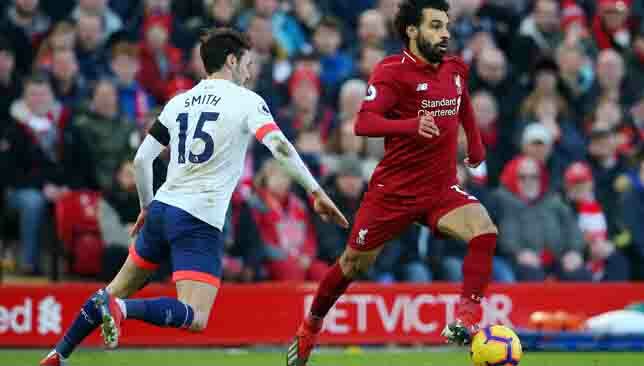 Salah made victory certain early in the second half and the Egyptian also hit the bar in a confident display. Paul Pogba scored twice as Manchester United moved into the top four – for a day at least – with an impressive 3-0 win at Fulham. Anthony Martial was also on target as United registered their 10th win in 11 matches in all competitions under interim manager Ole Gunnar Solskjaer. Martial set up Pogba’s opener after 14 minutes and doubled the lead before the interval. Pogba’s second came from the penalty spot after Juan Mata was fouled. Cardiff climbed out of the bottom three as they snatched a dramatic 2-1 win over Southampton in a remarkable finish at St Mary’s Stadium. Bottom side Huddersfield slumped to their 19th defeat as Arsenal won 2-1 at the John Smith’s Stadium. Alex Iwobi opened the scoring after 16 minutes when his volleyed effort slipped through the grasp of Ben Hamer. The effort did appear to take a deflection off Terence Kongolo but it was nevertheless a poor one for the keeper to concede. Alexandre Lacazette struck the Gunners’ second on the stroke of half-time after good work from Ainsley Maitland-Niles. Huddersfield’s consolation came in the form of a late own goal from Sead Kolasinac. Andre Gray scored the winner after 65 minutes, sweeping home a Will Hughes ball after a neat backheel from Craig Cathcart. Everton did hit the woodwork through Gylfi Sigurdsson and Lucas Digne but their recent slump continued. It was the Toffees’ 10th defeat in 16 games in all competitions. Wilfried Zaha rescued a point for Crystal Palace as Roy Hodgson’s side hit back for a 1-1 draw against West Ham at Selhurst Park. Zaha netted from a tight angle 14 minutes from time to cancel out Mark Noble’s first-half penalty. 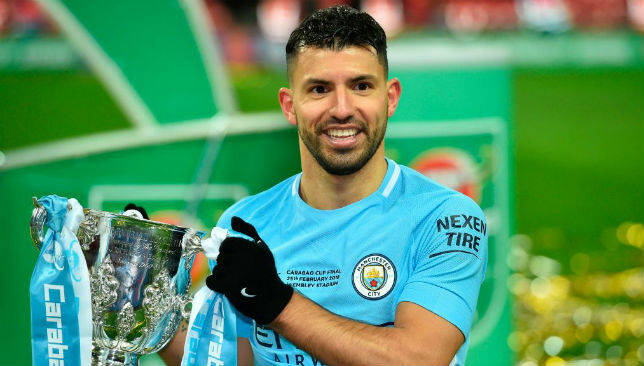 Aguero, 30, is already the club’s overall record scorer, having powered on to 219 since surpassing Brook’s previous best mark of 177 last season. City manager Guardiola said: “The big players need to appear in the key games, the big moments, and he did it. Hopefully he can continue doing it. In the big games we need important players. “(It is) not (Maurizio) Sarri, Pep, Jurgen (Klopp) or any manager. This game belongs to the players and important games belong to special players. That’s what he’s about. Aguero has been nothing short of sensational at City. 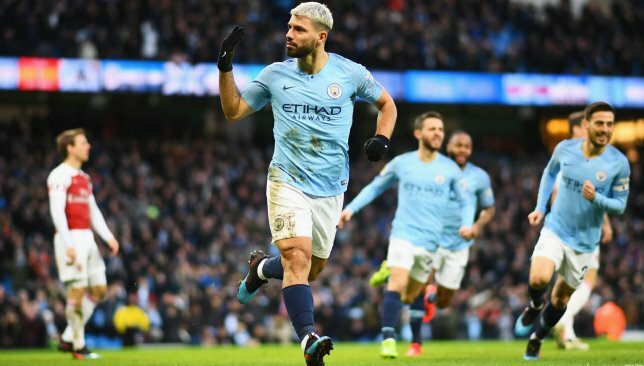 Aguero’s next such big game could be Sunday’s home Premier League clash with Chelsea, when City will be hoping to put more pressure on Liverpool in the title race. He has scored 12 goals in 16 appearances against the Londoners. Coincidentally, Chelsea are now managed by Sarri, who was Napoli boss when Aguero struck his record-breaking 178th City goal in a Champions League group match. City actually beat Napoli home and away in the competition but Guardiola was impressed by Sarri and he continues to be, despite recent criticism of the Italian following recent Chelsea results. Sarri’s side, who are 12 points behind City, lost two in succession before last week’s 5-0 thrashing of Huddersfield. Guardiola said: “I met him last season when we played against Napoli and I was so curious because I enjoyed, a lot, watching his Napoli. “I think the season from Chelsea is exceptional. They are in the final of the Carabao Cup, in the Europa League they went through easy, and in the Premier League they are there.